Basement membranes are sheet-like extracellular matrices found at the basal surfaces of epithelia and condensed mesenchyma. By preventing cell mixing and providing a cell-adhesive substrate, they play crucial roles in tissue development and function. Basement membranes are composed of an evolutionarily ancient set of large glycoproteins, which includes members of the laminin family, collagen IV, perlecan and nidogen/entactin [(PUBMED:8939648)]. Nidogen/entactin is an important basement membrane component, which promotes cell attachment, neutrophil chemotaxis, trophoblast outgrowth, and angiogenesis and interacts with many other basement membrane proteins, like collagen, perlecan, lamin, and has a potential role in the assembly and connection of networks. It consists of three globular regions, G1-G3. G1 and G2 are connected by a thread-like structure, whereas that between G2 and G3 is rod-like [(PUBMED:9633511), (PUBMED:11427896)]. 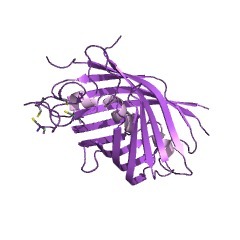 The nidogen G2 region binds to collagen IV and perlecan. The nidogen G2 structure is composed of two domains, an N-terminal EGF-like domain and a much larger beta-barrel domain of ~230 residues. The nidogen G2 beta-barrel consists of an 11-stranded beta-barrel of complex topology, the interior of which is traversed by the hydrophobic, predominantly alpha helical segment connecting strands C and D. The N-terminal half of the barrel comprises two beta-meanders (strands A-C and D-F) linked by the buried alpha-helical segment. The polypeptide chain then crosses the bottom of the barrel and forms a five-stranded Greek key motif in the C-terminal half of the domain. Helix alpha3 caps the top of the barrel and forms the interface to the EGF-like domain. The nidogen G2 beta-barrel domain has unexpected structural similarity to green fluorescent proteins of Cnidaria, suggesting that they derive from a common ancestor. A large surface patch on the barrel surface is strikingly conserved in all metazoan nidogens. Site-directed mutagenesis demonstrates that the conserved residues in the conserved patch are involved in the binding of perlecan, and possibly also of collagen IV [(PUBMED:11427896)]. A similar domain is also found in hemicentin, a protein which functions at various cell-cell and cell-matrix junctions and might assist in refining broad regions of cell contact into oriented, line-shaped junctions [(PUBMED:11222143)]. There are 442 G2F domains in 441 proteins in SMART's nrdb database. Taxonomic distribution of proteins containing G2F domain. This tree includes only several representative species. The complete taxonomic breakdown of all proteins with G2F domain is also avaliable. Click on the protein counts, or double click on taxonomic names to display all proteins containing G2F domain in the selected taxonomic class. Crystal structure and mutational analysis of a perlecan-binding fragmentof nidogen-1. Nidogen, an invariant component of basement membranes, is amultifunctional protein that interacts with most other major basementmembrane proteins. Here, we report the crystal structure of the mousenidogen-1 G2 fragment, which contains binding sites for collagen IV andperlecan. 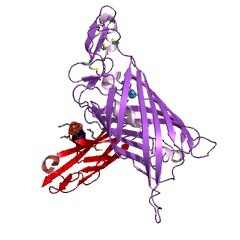 The structure is composed of an EGF-like domain and an11-stranded beta-barrel with a central helix. The beta-barrel domain hasunexpected similarity to green fluorescent protein. A large surface patchon the beta-barrel is strikingly conserved in all metazoan nidogens.Site-directed mutagenesis demonstrates that the conserved residues areinvolved in perlecan binding. Structural basis for the high-affinity interaction of nidogen-1 with immunoglobulin-like domain 3 of perlecan. Recombinant nidogen consists of three globular domains and mediatesbinding of laminin to collagen type IV. Recombinant mouse nidogen and two fragments were produced in mammaliancells and purified from culture medium without resorting to denaturingconditions. The truncated products were fragments Nd-I (positions 1-905)comprising the N-terminal globule and rod-like domain and Nd-IIcorresponding mainly to the C-terminal globule (position 906-1217).Recombinant nidogen was indistinguishable from authentic nidogen obtainedby guanidine dissociation from tumor tissue with respect to size,N-terminal sequence, CD spectra and immunochemical properties. Theydiffered in protease stability and shape indicating that the N-terminaldomain of the more native, recombinant protein consists of two globulesconnected by a flexible segment. This established a new model for theshape of nidogen consisting of three globes of variable mass (31-56 kDa)connected by either a rod-like or a thin segment. Recombinant nidogenformed stable complexes (Kd less than or equal to 1 nM) with laminin andcollagen IV in binding assays with soluble and immobilized ligands and asshown by electron microscopy. Inhibition assays demonstrated differentbinding sites on nidogen for both ligands with different specificities.This was confirmed in studies with fragment Nd-I binding to collagen IVand fragment Nd-II binding to laminin fragment P1. In addition,recombinant nidogen but not Nd-I was able to bridge between laminin or P1and collagen IV. Formation of such ternary complexes implicates a similarrole for nidogen in the supramolecular organization of basement membranes.